coil. Tubular pushed-in base ring. Pontil scar. Remarks: A shape with a cut-out flange, in combination with the zigzag decoration is rare. The lid is authentic but originally not belonging to this jar. Sometimes the decoration on a piece of glass is what makes it outstanding. Spanish glassmakers of the 17th to 18th Century often took this to extremes with their fins and finials. The following examples illustrating this point are from the Metropolitan Museum of Art and the Allaire Collection. This is a Roman jar with zig-zag trailing between the top of the rim to the shoulder of the body. It was probably made in the eastern Mediterranean area. D: 11 cm. H: 9 cm. This Coptic bowl from the Roman period was made in Egypt. 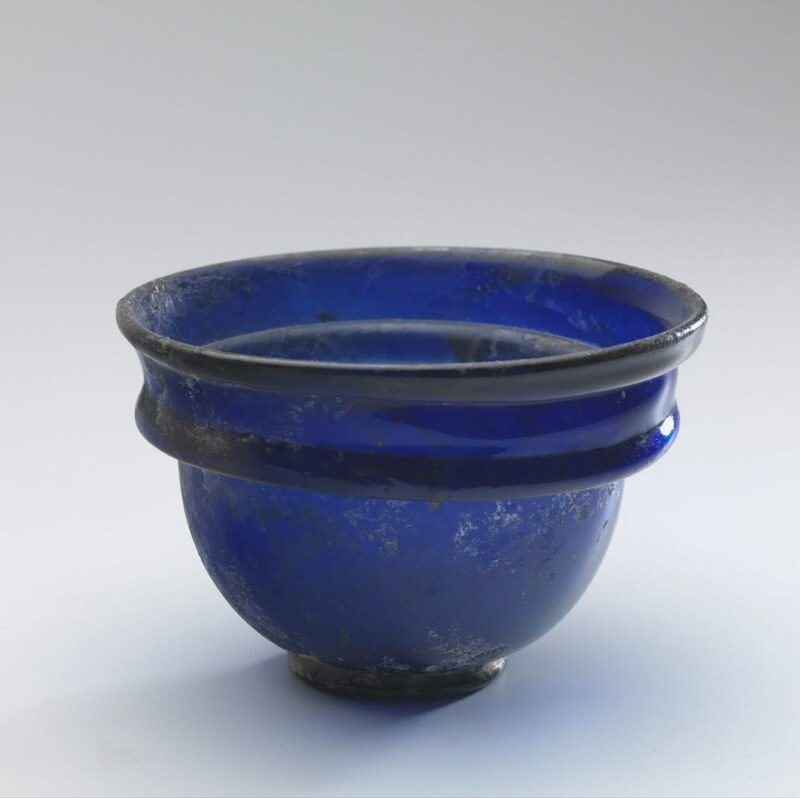 This link is to another Egyptian glass bowl from this area. 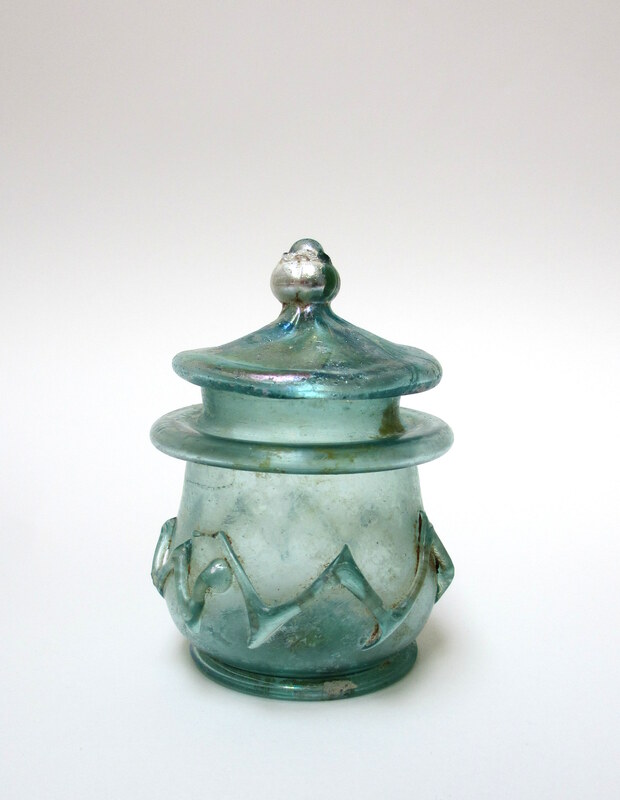 Also see two Museum collections of glass from Karanis, The Brooklyn Museum and Kelsey Museum. 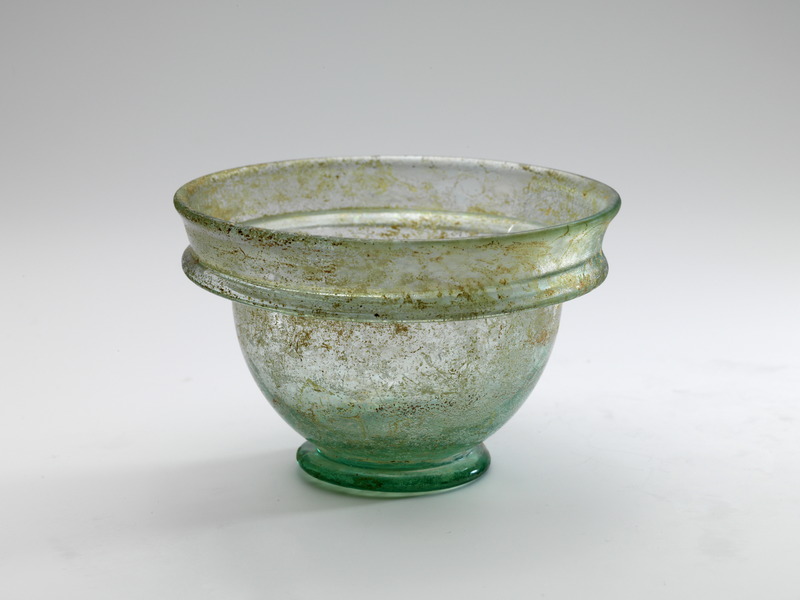 Coptic glass bowl 4th C.
First half of 1st century AD. Syro-Palestinian, probably Sidonian. H= 8.6 cm. D max= 4.1 cm. D rim= 2.0 cm. Weight 28 gr. Condition:Intact. Minor weathering and incrustation. Technique: Body blown into a two-part mold of two vertical sections (MCT VIII A). Neck free blown, rim tooled. Handles applied. 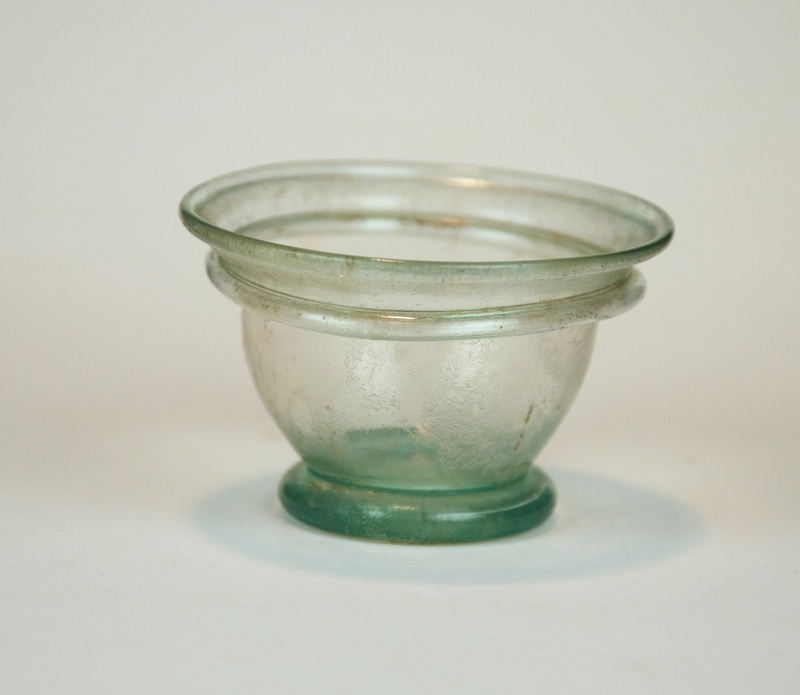 Description: Transparent, clear pale bluish green glass for body and handles. Ovoid body with flat base. Concave neck with curved transition to shoulder. Rim folded out, up, in and down. Two coil handles applied to underside of rim , drawn down to shoulder (not attached), cut off at tip and pinched to form a small disc. One handle positioned on the mold seam, the other one adjacent to it. One continuous mold seam around body and base. Vessel shaped like a miniatureamphora encased in a wicker basket, with a branch of eight pairs of two laurel leaves alternating with laurel berries around the middle of the basket. On one side the leaves point to the right, on the other side to the left. 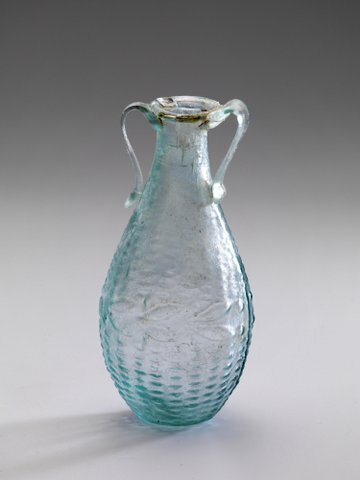 Remarks: Stern describes ten types of mold blown glass bottles like this one, that can be attributed to the workshop of the “Floating Handles”, most probably active in Sidon. 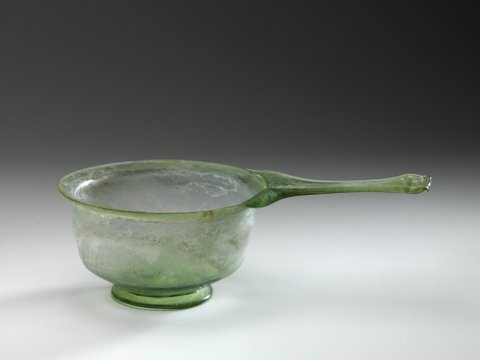 Roman workshops usually made handles by applying a bit of glass to the shoulder or body of a vessel and then pulling it upward toward the neck or rim where it was attached. In the workshop of the “Floating Handles”, the glass blowers made handles the other way around. The hot bit was applied to (or near) the rim and then pulled downward toward the shoulder or body. With a tool, perhaps a type of shears or pincers, they pinched it to form a small disk at the lower tip of the handle. This pinching cooled the glass too much to let it attach to the wall of the vessel. The lower end of the handle in fact “floats”. 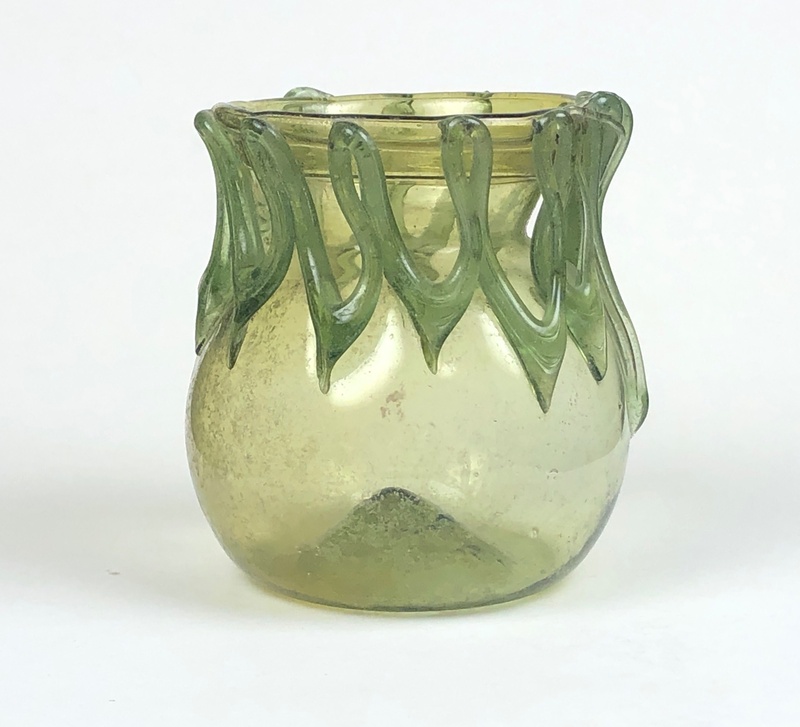 The decoration on this bottle is based on the actual practice of protecting glass transport vessels by wrapping them in wickerwork, as can be seen on a few ancient glass vessels which still retain their wicker baskets. Provenance: Charles Ede Antiquities, London, 2008. Collection Mr. F. of Surrey (1909-1984). Published: Groen 2011, Romeins Glas uit Particulier Bezit, p. 69. Bonhams 26 April 2007, No. 17. Reference: Kunina 1997, Hermitage Museum, No. 129. Saldern 1974, Oppenländer Collection, No. 431. Stern 1995, Toledo Museum, No. 59. Christie’s 5/6 March 1985, Kofler-Truniger Collection, No. 112. Israeli 2011, Shlomo Moussaieff Collection, p. 84 Christie’s 5/6 March 1985, Kofler-Truniger Collection, No. 112. Late 1st – early 2nd century AD. Western Empire. H= 6.1 cm. D rim= 11.1 cm. D base= 5.7 cm. L= 19.4 cm. Weight 113 gr. Classification: Isings 1957: Form 75b. Condition:Intact. Some weathering and iridescence. Technique: Free blown. Handle and foot applied. Description: Transparent pale green glass. Pan with deep cup and handle. Rim outfolded and rounded. Vertical wall slightly bulging just below rim and curving in sharply at bottom. Flat base with pointed kick and no pontil mark. Foot applied, outsplayed and with traces of tooling. Long flattened handle, made of drawn-out trail, attached to lip, then pinched out, with pincer-marks on top and bottom and excess glass folded back on whole length of the underside to the rim. Handle very broad at attachment to rim, narrowing to the middle and broadening again at the end. Remarks: The word “trulla” can be defined as “ladle” or “dipper”. They were widely used inthe Roman Empire, serving as ritual objects in religious ceremonies for libations or for drinking or pouring purposes and even in bathing activities. Published: Gorny & Mosch 17 June 2004, No. 211. Reference: Whitehouse 1997, Corning Museum, No. 346. Hayes 1975, Ontario Museum, No. 148. Arveiller-Dulong 2005, Louvre Museum, No. 36. Massabò 2001, Aquileia Museum, No. 72. Saldern 1974, Oppenländer Collection, No. 557 (p. 241). The glass manufacturing industry of the past is not unlike that of today. When a design is popular the maker has a good reason to create many of them, as well as being copied by other companies! The following examples illustrate these similarities in form & decoration.